I’ve got an amazing twist on a classic apple pie recipe to share with you today! We’re serving up Raspberry Apple Pie for thanksgiving this year, and the blast of berry flavor is a surprise ingredient everyone will welcome. With so many dessert options around the holidays, it’s important that the dessert you bring to the party is the one that stands out. There’s no use putting your heart and soul into baking homemade pie, only to bring most of it home at the end of an event. Well, I can guarantee that won’t happen if you serve raspberry apple pie to your friends and family this holiday season. We bring home bushels of hand-picked apples every fall and a good portion of them end up in pies… So you could say I’ve made my fair share of apple pies over the years. Classic apple pies, some with crumb toppings, others with savory elements. Yet, I’ve never seen an apple pie disappear as fast as this one! The extra pop of vibrant raspberry flavor from fresh Driscoll’s Raspberries makes this raspberry apple pie recipe the shining beacon of fruity bliss at any holiday event. I started my Raspberry Apple Pie much like I would have started any apple pie. I made my pie crust and gingerly placed one piece in a large deep-dish pie pan. Before filling the pie crust, I tossed in fresh sweet raspberries and a large scoop of raspberry preserves. Then I cut the second crust into hearts to cover the top of the pie so there are plenty of natural air vents. Pretty and practical. 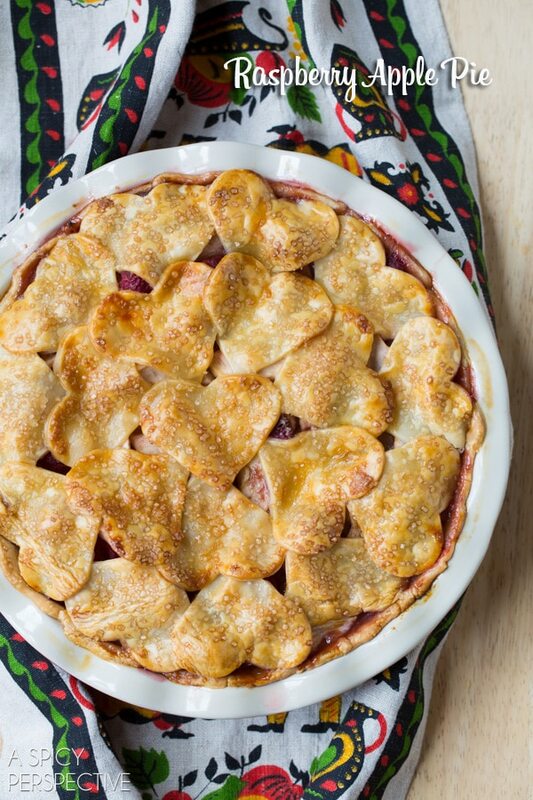 The apples and raspberries bake and bubble together inside the pie creating the most glorious aroma and flavor. Raspberry Apple Pie is brighter and bolder than standard apple pie, with pink dripping Driscoll’s raspberries speckled throughout. It’s a pie with punch! 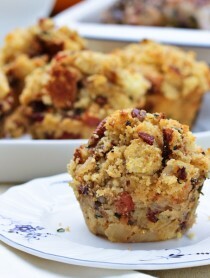 Find many more raspberry kissed holiday dishes on Driscolls.com. 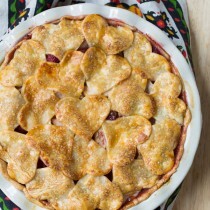 This tangy-sweet Raspberry Apple Pie Recipe is a huge hit around the holidays! It is loaded with the comforting flavors of classic apple pie. Preheat the oven to 450 degree F and place the rack in the lowest position. Place a piece of plastic wrap (or foil) out on the counter. Flour the plastic wrap and place the pie crust dough on the floured work surface. 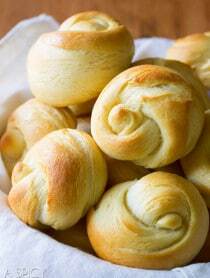 Flour a rolling pin and roll one dough disk out into a large round circle approximately 12 inches across. Carefully lift the plastic wrap and flip the dough circle over into a 9 inch deep-dish pie pan. Gently fit the pie dough down into the pie pan–don’t stretch it. Then fold the rough edges under and pinch-crimp the edges with your fingers. Place the lemon juice in a large bowl. Peel and thinly slice all the apples (1/8-1/4 inch thick) tossing in the lemon juice as you add them to the bowl. 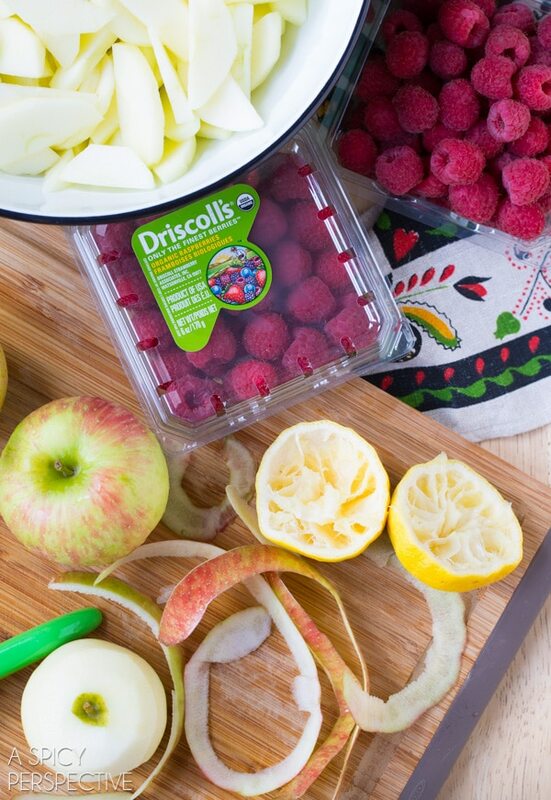 Add the Driscoll’s Raspberries, granulated sugar, raspberry preserves, corn starch, spices, and salt to the apples. Gently toss the mixture by hand to coat. Scoop the raspberry apple filling into the pie crust. Shake a little so the filling settles into place. Roll out the second pie crust and use a cookie cutter to cut fun shapes for the top crust. (I used a heart cookie cutter.) Lay the pie crust shapes over the filling, overlapping on the edges. Then whisk the egg and water to create an eggwash. Brush the eggwash over the top of the pie crust, then sprinkle the top of the crust with coarse Demerara sugar. Place the pie in the oven, and LOWER THE TEMPERATURE TO 375 DEGREES F. The extra heat from the beginning gives the crust a little head start in baking. Bake the pie for 70-80 minutes, until golden and bubbly. If the crust starts to get dark, loosely cover with foil while baking. 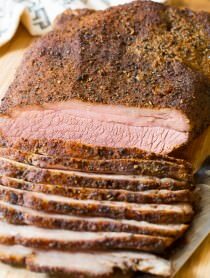 *Make sure you see the juices bubbling – otherwise the filling will be runny. This is the hard part… DO NOT cut the pie until it has cooled down to room temperature. I know it smells amazing and is very hard to resist, but the filling needs time to settle and set, so it’s not soupy. If you cut your pie too soon, it will fall apart. I suggest making the pie in evening before you need it and let it rest overnight. Disclosure: The post is sponsored by Driscoll’s Berries. All opinions are my own. My kids love them. Thanks for sharing. Loved the pie. Just finished it for a delight of Luscious raspberry/apple pit a la mode this evening with guests. The heart crust adds just the cute touch. I think I will also make it at thanks giving with a nice swirl of leaf cutouts for the crust. Thank you for another fabulous and fun recipe. This is beautiful! I love the hearts. What a great idea. This looks amazing, Sommer! I love apples and raspberries. YUM! this sounds delicious, but also I LOVE how you did the top crust!!!! Just pinned…I love raspberries, and this look amazing! Love the cute hearts on top. 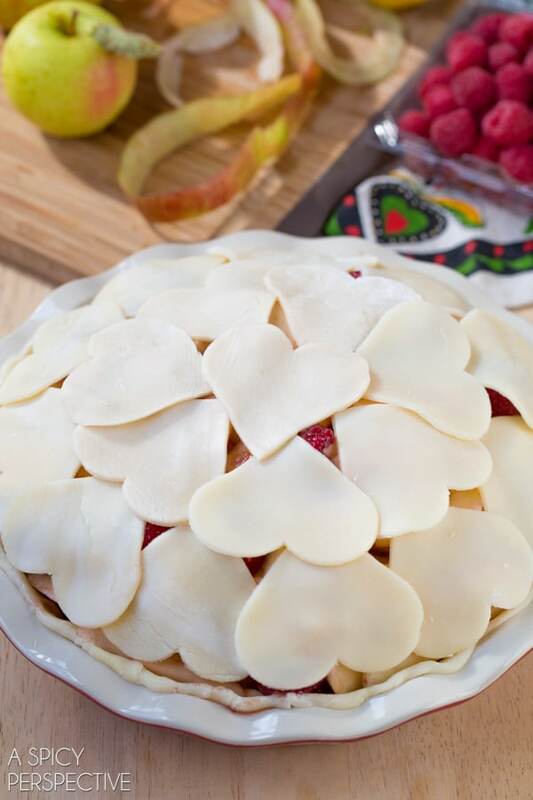 Love the addition of raspberries and those pretty heart cut-outs! This looks amazing! So gorgeous!!! I love everything about this pie – the combination of apples and raspberries, the heart pie crust topping, all of it! I bet it tasted incredible. Beautiful! Apple pie is one of my favorites, but this version looks so much better! The family likes classic thanksgiving dishes while I like more daring things. Maybe we can meet in the middle with this pie. Your heart crust is so adorable too! Pinned! What a delicious sounding pie! I just scored a bunch of blackberries through Bountiful Baskets that I will pick up (and then freeze) this weekend, so I’m going to make mine with blackberries for Thanksgiving. I bet it will taste amazing! The raspberries are such a beautiful addition Sommer! and I just love the hearts!! 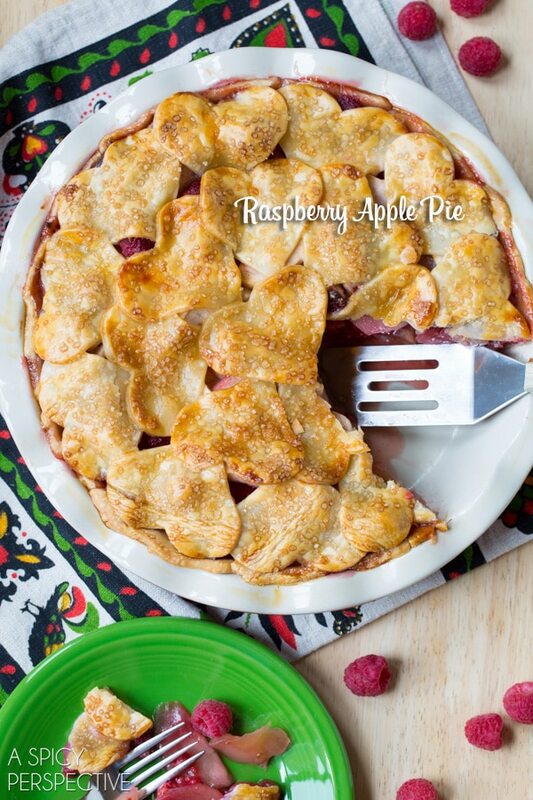 Raspberry is a perfect update to a classic apple pie! I love the hearts! What a fab pie!!!! I love the combo you put together. But you really made this above and beyond with the darling creative crust. What a delicious and amazing combo! I never thought about apples and raspberries in one awesome pie! And I just love the heart shapes on top! What a gorgeous pie, Sommer! I love the raspberry apple variety! I’m usually not a huge pie person, but I can’t turn down those raspberries! Yum!! Looks yummy! Sadly my assigned dish, as always, is pecan pie. I am going rogue and bringing and cornmeal apple cake and broccoli casserole as well (they don’t do veg but corn there). Maybe I’ll get myself uninvited to Christmas Eve! Love the flavor combination and the sweet look of this pie! 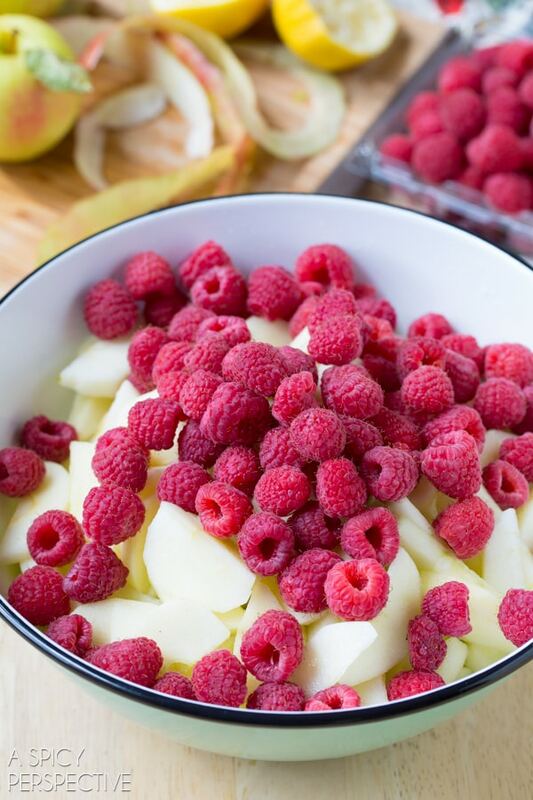 Raspberry and apple is a great combination! Love the hearts! 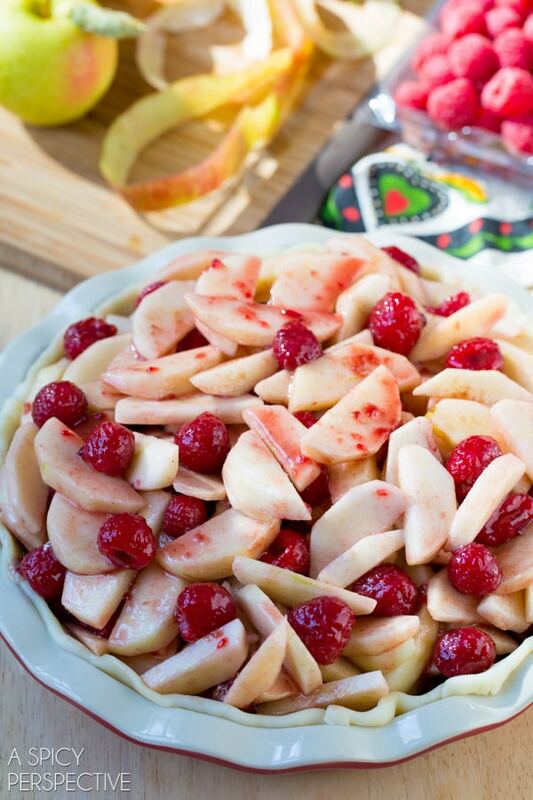 I love raspberries + apples – such a cute pie! Beautiful! I love all of those hearts!! Sommer, this is such a pretty pie & I love the heart cut outs! What a gorgeous pie and my family would love it if I made it for Thanksgiving. That is one beautiful pie! Love the apple raspberry combo. Perfect!! What a great flavor combo! I love raspberry everything and this pie would be so gorgeous for the holidays! You can just SEE the love baked into this pie! But, this pie is beautiful, and I have NEVER had raspberries and apples before…love the change! Pinned!